Sorry Cronulla, but violating the salary cap in the past isn't just a "historical issue"
When is the NRL going to get real about the salary cap? Apparently not any time this season, after the Sharks were given the all-clear to participate in the upcoming finals. 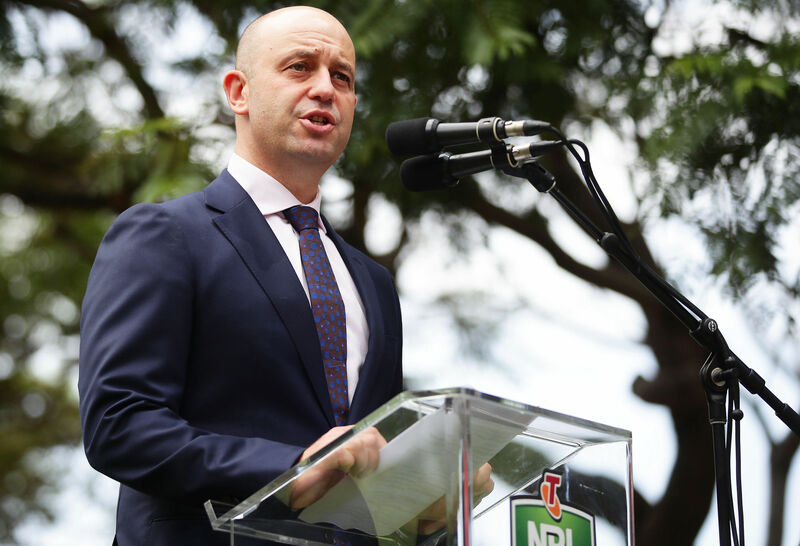 On Wednesday afternoon, Todd Greenberg fronted the press to assure the rugby league public that there’s no fire, despite the smoke billowing out of the Sutherland Shire. “Every club in the NRL, that includes the Sharks, are cap compliant in 2018. The 2018 finals series will not be affected by this investigation,” the NRL CEO said at a press conference on Wednesday afternoon. It came after the Sharks put out a press release on Tuesday evening saying they had self-reported “discrepancies relating to historical third-party player payments”, and the NRL said its integrity unit is looking into “salary cap matters” at the club in the 2015 and 2017 seasons. Now, I’m not a historian – and technically anything that happened even a second ago is in the past, so therefore part of history – but I am a pedant, so please, indulge me this question: are we really going to let a potential breach that occurred last season be termed a “historical issue”? By referring to the discrepancies as “historical” – which Cronulla did twice in their 120-word statement – the club was aiming to minimise the impact these issues have on the present. And they have been successful in this endeavour, with the NRL seemingly comfortable allowing the Sharks to play finals footy, because they’re cap compliant this year. But the salary cap can’t be treated as a year-at-a-time proposition. While we hear about players getting x dollars over y seasons, these are rarely flat annual salaries, and it’s where all the talk of front- and back-ended deals come in. A player might take significantly less in the first year of their contract, because that’s when the club is experiencing cap pressure, but then they’ll get a balloon payment in the final year to make up for that first-season shortfall. As such, when you’re in a competition that has strict rules over how much financial recompense an entire squad can receive, exceeding that amount gives your club a significant advantage the others don’t get, which helps you recruit and retain quality players. And when players sign contracts that last multiple seasons, that advantage can last for a number of years, even if you only went over the limit once (or, as the case may be, twice). Yet, if the Sharks are found to have been doing this in two of the last three completed seasons, the NRL is apparently willing to let it go as far as this season is concerned, because it didn’t happen this year. While Cronulla CEO Barry Russell has said that the issues do not relate to the current playing squad, it doesn’t really matter who received the money. Even if all the club’s current players are clean as a whistle – and we have no reason to suspect they are not – their recruitment and retention was made immeasurably easier if the club had two years’ worth of undeclared funds to pay past players and therefore structure other deals. If you’ll pardon a lame analogy: when you’ve got a larger pool, you can keep the bigger sharks. It has everything to do with this year! The cap – and someone’s bank account – doesn’t restart because a grand final’s been played, but that’s the message the NRL sends if they simply say that the finances of two of the last three years can have no effect on the current season. Look, maybe at the end of this whole investigation, it will turn out Cronulla made an error that barely deserves a fine – honestly, that happens regularly enough, and part of the reason Greenberg is comfortable with the Sharks being in the eight is that their potential breach “is not on the scale of previous investigations”. But to be willing to term a salary cap issue – for a highly successful club, that allegedly occurred two years out of three, and as recently as last season – as being “historical” and therefore having no bearing on this year’s finals completely fails to grasp the cap’s purpose.